Barry Byrne church architect, 1930. Barry Byrne church architect, c. 1965. 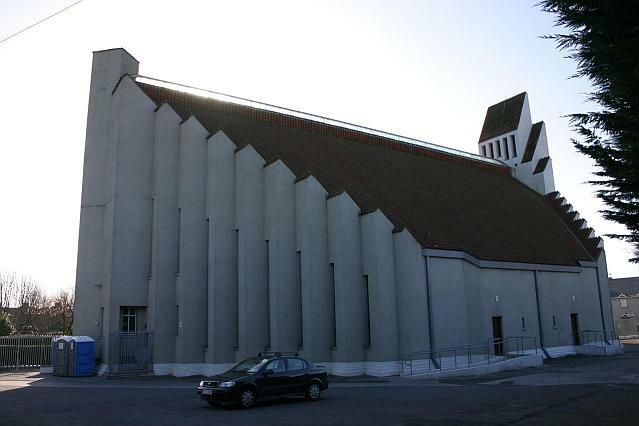 The design of this church is based on the principles of Art Deco which makes strong use of symmetric and geometric forms. The ground plan is based on an elongated octagonal shape, the longer ends representing the front and rear of the church. Re-enforced concrete pillars form a cascade effect, connecting the long side-walls to the front and rear towers. There are no side windows as such. Instead. tall narrow openings are located between the cascading pillars. A long glass roof apex provides additional light from above. 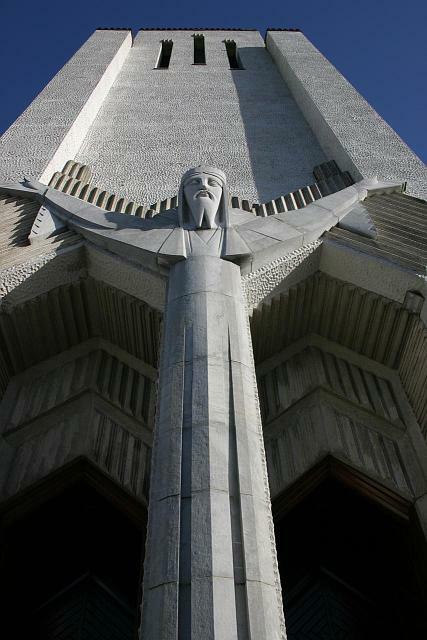 A 19ft statue of Christ stands at the entrance with its arms out-stretched over the two doors. The statue was designed by Chicago sculptor John Storrs and executed locally by sculptor John Maguire based on plaster models shipped to Cork. The church entrance is a clever manipulation of the famous Barry Byrne chevron used to form a peak over each entrance door. These peaks blend into the sleeves and arms of the statue in a manner that makes the sculpture part of the entrance as opposed to being just a feature. 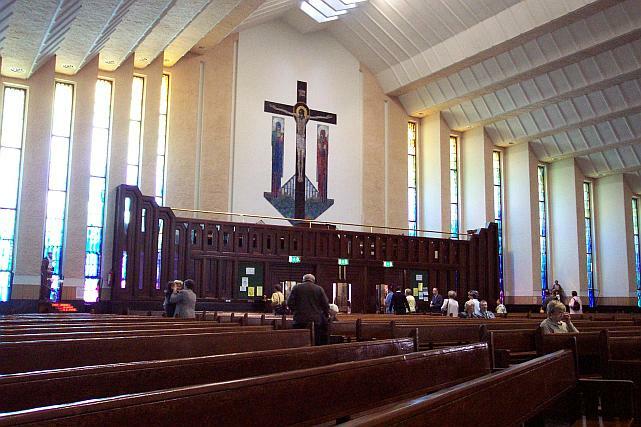 The interior design of the Church of Christ the King is a surviving testimony to the forward looking Byrne. 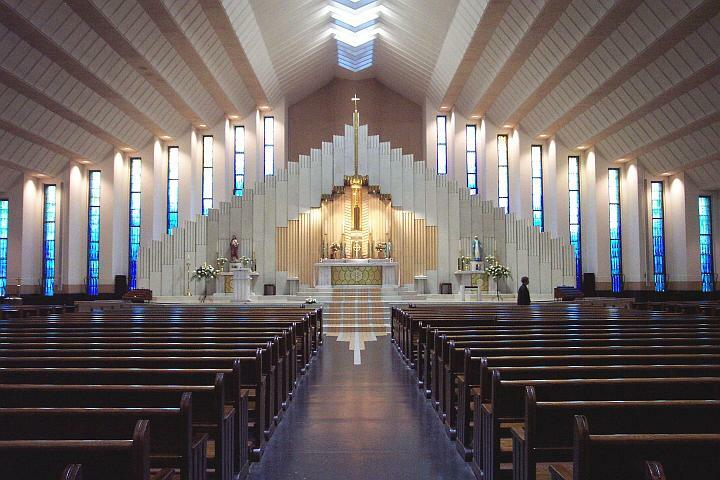 His design concepts were based on his opinion that an altar and congregation should be integrated. Prior to the Vatican II council, the priest would face away from the congregation when performing the mass. Many church designs were narrow and often placed a distance between the the sanctuary and congregation. The altars were also placed against the back wall of the sanctuary. Byrne opposed the conservative views of typical church design. He not only broke the convention of distance, but instead elevated the entire sanctuary and partially surrounded it with the congregation. Combining this with a feeling of continuity within the structure, Barry Byrne succeeded in integrating the sanctuary and nave. Such is this integration that the width exceeds the length by some 16 feet. It would take forty years for these design principles to become standards in Catholic church design. The church has no side windows, Instead tall and narrow stained glass windows are located between the cascading pillars at both the front and rear of the church. The windows are untypical in the sense that they do not portray holy figures. However the do comprise of symmetrical patterns that mimic the same chevron shapes portrayed by the cast stone ornament used on the exterior. Additionally, the glass uses a co-ordinated colour scheme that combines a series of blues, greens and amber shades. The colour scheme of these windows was designed by the architects’ wife, Annette Cremin Byrne. The seating in its original layout comprised of 4 sets of rows that ran the full length of the church with the far outer sets gradually shortening in length to continue as far as possible toward the sanctuary. The seating capacity was for 1200 seated and 700 standing. 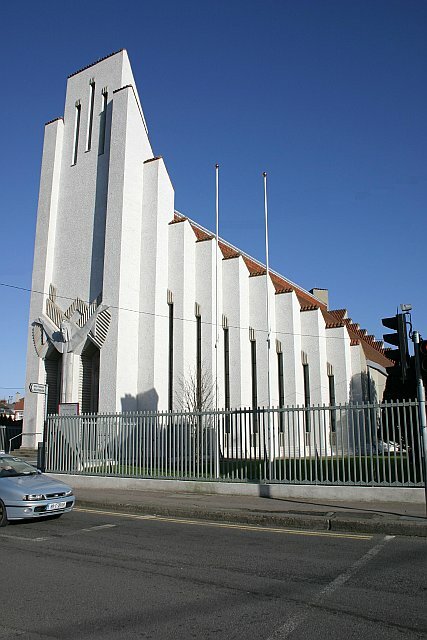 When originally commissioned, the church served Turners Cross and Ballyphehane and such capacities were not untypical. The demand for such a large capacity is no longer an issue and some of the original seating has been removed to make space on either side of the sanctuary. This space is used for baptisms and also to locate the Christmas crib. Some of the central rows have also been removed to form a break in the aisles allowing faster access to the fire exits and easing the movement of the congregation. A new seating layout on the outer rows, has the seats tilted toward the altar. The sanctuary area spans almost the entire width of the church in an impressive manner. Even with todays liberal thinking, such large-scale designs are quite rare. The Altar reredos is based on the same stepped motif used to model the exterior and ceiling. The reredos itself comprises of panels of cast terrazzo, some smooth, with others used to convey a zig-zag like pattern. The inner area uses a beige-colouring and reflects the octagonal shape of the ground plan. A brass canopy is suspended over the original high altar space. Its shape is also based on same stepped motif used to define the front and rear of the building. The altar plateau is elevated three steps higher from the wide sanctuary plateau to again raise its profile and enhance the view. The altar as we see it today, was originally placed about 1 foot from the reredos. 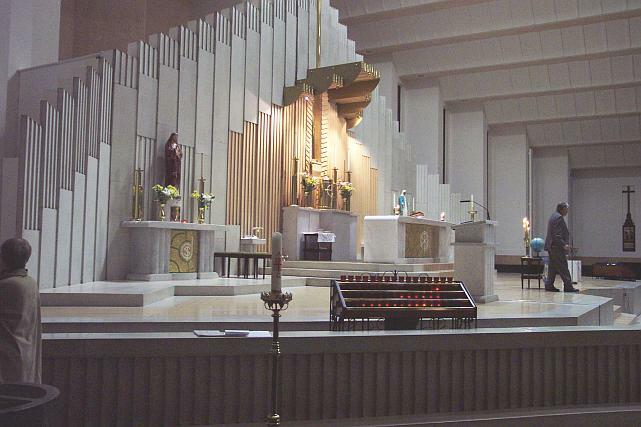 After Vatican II, where the priest was now encouraged to stand behind the altar and face the congregation, a wooden altar was used in place of the original which was now unusable in its “Latin” position. Later on, renovation of the original altar, brought it forward to the edge of the altar plateau, with the addition of a narrow replacement behind. Byrnes adequate sizing of this plateau may have been based on his assumption that the mass format would eventually warrant the priest to face the congregation as with most other Christian religions. The altar floor is made from different segments of cast stone, again themed in white and beige. Another innovative feature of the altar is the communion rail which forms the outer wall of the sanctuary plateau, but because of the higher profile of the sanctuary, it does not form a barrier and give the congregation the sense of being “railed off” from the priest. Byrnes’ concepts of sanctuary and nave integration had him experimenting with various ways of integrating features of both. 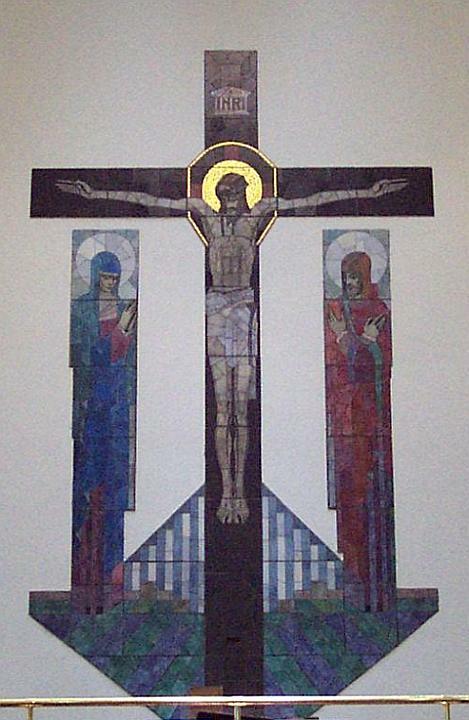 In his previous church of Christ the King, Tulsa Oklahoma, Byrne had integrated the Stations of the Cross with the sanctuary. In this design, the side altars were positioned on the sanctuary plateau and designed as miniature versions of the main altar. Such is the smooth integration of these altars with the main sanctuary, that it almost goes unnoticed. The original artificial lighting was designed to be out of view. 100W lights were positioned over every glass pane in the ceiling apex with 400W lights used above the altar. 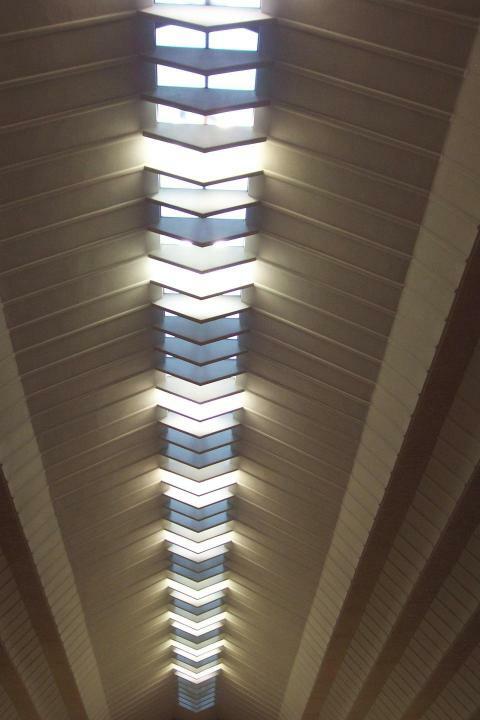 In conjunction with a series of downward pointing slots, the artificial light shone directly down without causing diagonal glare for the congregation. It was in essence an attempt to provide a unified source for ceiling light, be it daylight or artificial. Additional inset lighting was provided along the ceiling rim. 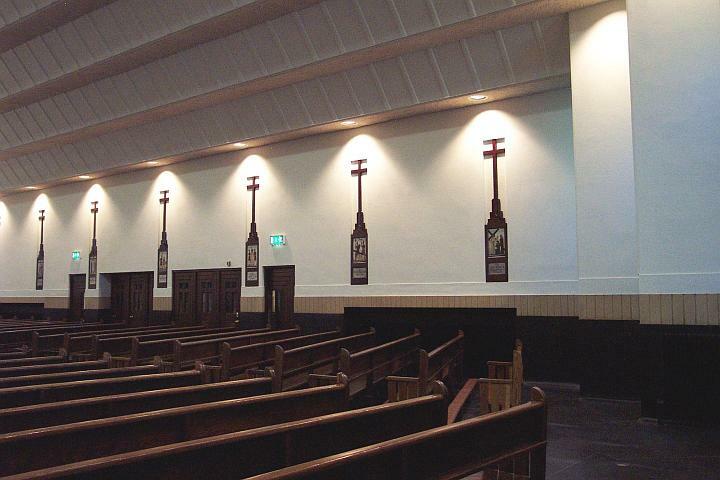 This lighting runs down both sides of the church and is cleverly positioned over each of the stained-glass windows (front and back) and also over the 14 stations of the cross, which are embossed in the two side walls. Each rim light was originally specified at 150W. One of the major complaints from parishioners and visitors alike was that the church was dimly lit and during the years, new central overhead lighting was installed to provide more interior light. The concealed lighting was removed and replaced by a series of overhead spotlights. These lights were suspended below the glass strip and while providing more light than their predecessors, the effect of Byrnes original design was lost. Recent restoration work has resulted in the installation of new and more powerful lighting that is again recessed above the glass apex as originally intended by the architect. The rim lighting is also enhanced with more powerful spotlights providing a stronger feed of light over windows and stations. The 14 stations represent the only decoration on the two side walls. Each station is rendered in a tall wooden frame and embossed into the wall. The frame uses the same “themed” stepped motif to form the base of the crucifix. The scene and lettering is characteristically Roman in design. Clever positioning of the rim lighting ensures that each station is individually lit. This approach is based on Byrnes’ view that the Stations play a very important part in the Liturgy and that “hanging them up like pictures”, is not appropriate. Annette Cremin Byrne designed the fittings which were furnished by Egans of Cork. The original choir loft was located behind the altar (upstairs from the sacristy). A poor projection of sound and restricted visibility prompted a move in the late sixties to build a choir loft over the inner porch, giving the parishioners their first real view of the choir. Up to and including the Turners Cross commission, Byrne had used this approach in locating the choir and organ behind the altar reredos. His reasoning was that both should be close together and behind the altar looked like the obvious choice, if he was to maintain the unobstructed view. The inner porch or narthex was originally designed to house the mortuary and baptismal font. It is a wooden frame of typical Byrne design with tall narrow openings. 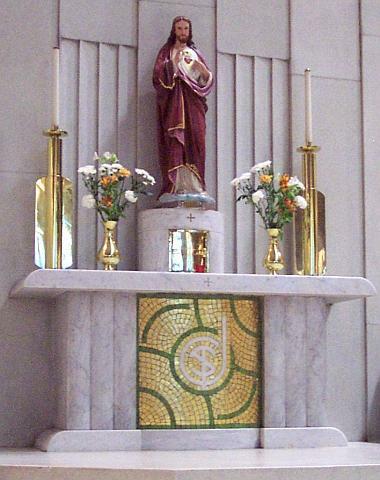 It strongly resembles the reredos used in a previous church in Racine Wisconsin. Originally it had no ceiling and was in essence a fence around the entrance. The mortuary and baptismal font however, were enclosed by access doors. giving them adequate separation. Years later Byrne abandoned his concealed gallery concept based on endless complaints he had received about how awkward it was for an organist and choir master to see the priest. Some of the earlier churches had even deployed mirrors to help increase visibility. But eventually all choir galleries ended up as storage rooms, with the choirs relocating to the sides or nave.The relocation of the choir gallery to this location involved the construction of a ceiling over the narthex. One of the side rooms was then used to house an access stairs and consequently the baptismal font was relocated to the top left of the sanctuary. This was a very adequate move as relaxed Rubrics encouraged a more central location of the baptismal font. Today the casual observer will assume the choir gallery was always present over the narthex, such is its suitable location. The rear wall of the nave is beautifically decorated by a mosaic of the crucifixion. Its’ design uses similar colour schemes to the stained glass windows and mimics the stepped motif theme used elsewhere in the interior. It was executed in 1936 by Hubert McGoldrick of An Tur Gloine. The observer is often mistaken in believing that the inner ceiling and roof are parallel and very close together. However by referring to the cross section diagram, you can see that the inner ceiling angle is much smaller than that of the outer roof. The ceiling is in fact a complex shaped grid of steel supports that is suspended from the steel roof structure. Plaster tiles are slotted in between the steel supports to form the stepped motif. The grid layout of the ceiling is partially revealed by ribbed features along the surface. These are in fact plaster molds used to cover the exposed parts of the steel supports. Suspended ceilings were used in most of Barry Byrnes designs, but none were as complicated as this given the sheer amount of plaster to be suspended and the intricate design of the stepped motif. The bell tower access shaft is located within the pier just to the right of the bell tower. 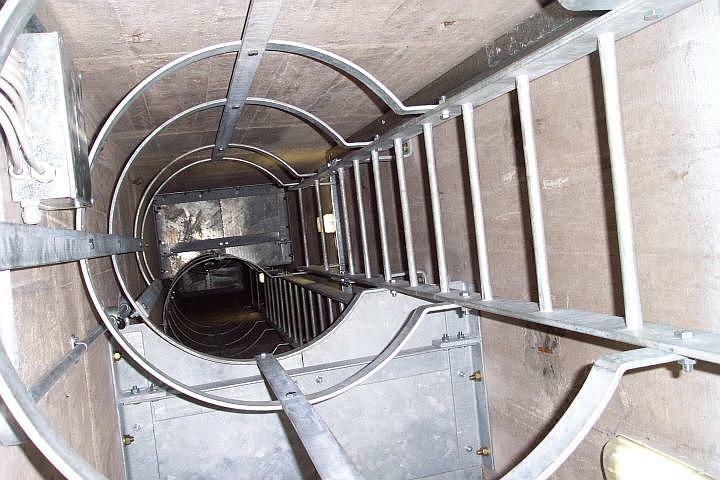 The shaft is about 1.5m square and was originally fitted with an open ladder. The new safety ladder provides rest sections and protection by means of safety rings. The shaft provides access to two chambers. The first chamber is positioned just above the chevron of the front doors and is basically a storage point for roof tiles. The second chamber located just under the bell tower provides access to two gangways that span the inner attic and ceiling supports. This chamber also provides a short access shaft to the bell tower. These would have been used during construction at a time when large construction cranes did not exist. The Bell tower consists of narrow openings in theme with the buildings’ shape and windows. The bell sits on a steel frame, complete with its original flywheel. The bell is now rung automatically by an electronic hammer. 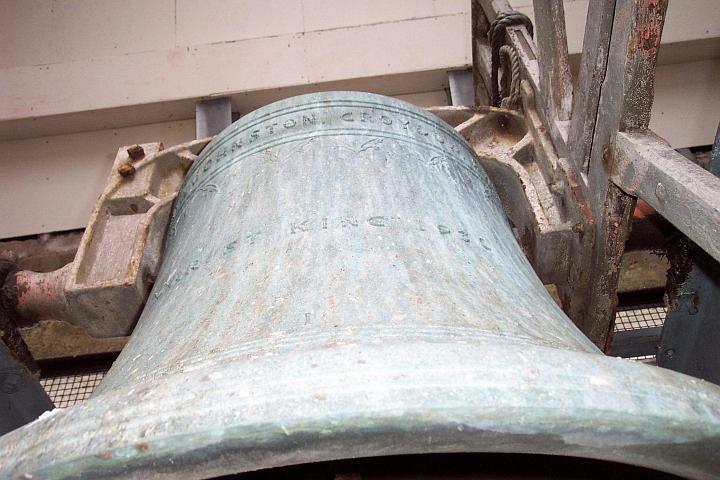 Etched on the Bell is the manufacturers name and location: “Johnston Croydon” and “Christ King 1930”. The attic houses the suspended ceiling supports. 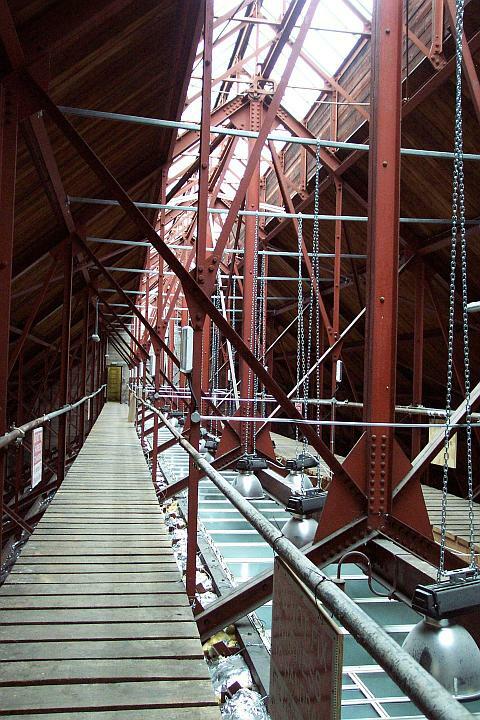 Seven steel trusses span the width of the church and are positioned at various points from front to rear. 5 trusses span the two side walls and then one each on the front and rear cascading sections. These form the outer profile roof and also a solid framework from which the ceiling is suspended. Two wooden gangways run alongside the ceiling apex providing a useful means of accessing the ceiling structure and light fittings. In the distance, you can see one of the attic access doors and the short ladder to the bell tower. The glass skylight provides a generous feed of natural light downward through the attic apex and into the church.